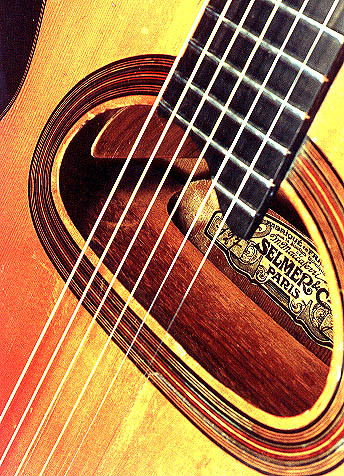 Selmer's 1932-33 Maccaferri model, with the large D-shaped soundhole, was originally designed specifically to accommodate the Internal Resonator. The patent numbers on the headstock and label of the early Selmers were for this particular feature. Theoretically, every D-hole Selmer left the shop with a resonator inside it. However, few original Selmers retain one. We believe this was often due to a production error that caused them to come loose and buzz, provoking their prompt and sometime brutal removal. 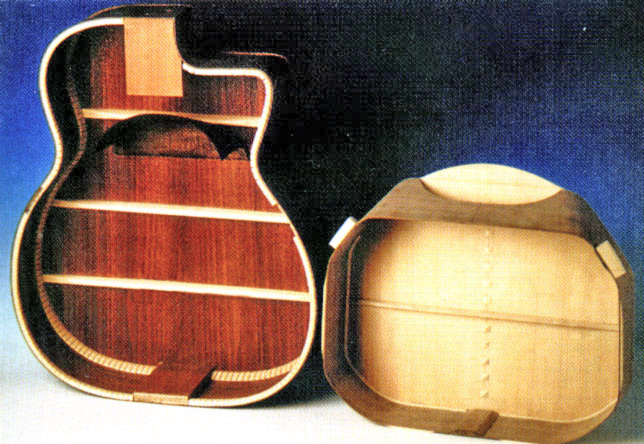 Basically, the internal resonator is a small body inside the regular guitar body. It is glued to the top, all around the edges, and just hangs inside the outer box of the body. The sound leaves the resonator through an opening in the side of the resonator closest to the soundhole, and is directed, or reflected, out the soundhole by a curved wooden surface, sort of a chute or shield attached to the back brace directly inside the soundhole. The "floor" of the resonator lies just above the actual back of the guitar, and the resonator walls rest just clear of the sides of the guitar. The later Selmer model, with the small vertical oval soundhole, never had a resonator; in fact, it was a design repudiation of the resonator model. Furthermore, while we're smashing myths, Django Reinhardt never played a Selmer with an internal resonator. As can be seen in a plethora of photographs, even his early D-hole guitars had no resonator. 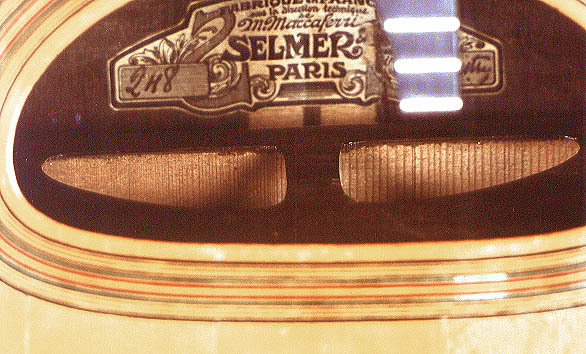 There were two main resonator designs in the early Selmer days. There was one which worked well, shown at left here. The label is glued to the tongue of the resonator. The reflecting plate appears above it, under the upper edge of the soundhole. This guitar is a renecked grande modèle four-string, and its fingerboard is not to original specs. The other resonator, below, had two smaller openings and was a bit less successful. Because of Mario Maccaferri's brief tenure with Selmer, few were ever really built, far fewer survived. The Internal Resonator, when it works correctly, has a profound and very salutary effect on the tone. It does not increase the volume but rather acts as a bass reflex, altering the EQ of the guitar. The Internal Resonator is a great deal of trouble to make and install, but well worth it. Mario Maccaferri was a perfectionist. He felt the human body dampened the vibrations of the back of the guitar, so he put in the resonator so its back could resonate freely. Meanwhile, the real back of the guitar was a throwaway. Few people believe this was actually the real situation. It does not make the guitar louder! But I will say that it changes the sound a lot, very much like a bass reflex. Bass reflex is terminology from speaker cabinet design, and general room acoustics, as in tuning auditoriums and performance halls. The resonator is simply a chamber which provides a defined space of air that shapes the soundwaves a certain way before they pass out through the hole in the resonator and out the soundhole of the guitar. 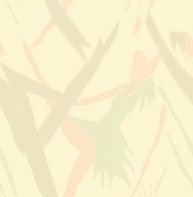 Every room sounds different, as does every guitar body - because the walls have different sizes and shapes, are made of different things, and so forth. A bass reflex enhances certain frequencies, altering and even deepening the tone in a way. Another example is speaker cabinet design: if you understand this art, you know it is possible to manipulate certain structural design aspects of the box and its porting, and each change results in a different characteristic sound. We also understand that with correct engineering, some very small cabinets can generate some very deep sounds. Any guitar body is a resonator in the general sense: it amplifies the signal of the vibrating string. Maccaferri's resonator has nothing to do with volume, but rather has to do with the precise profile of the overtones. The strings produce their little signal, the top does a great deal to amplify that, and various other factors have an effect on the rainbow of frequencies that collectively come out of the guitar in one way or another. For example, the mass and tonal characteristics of the woods involved, the shape and volume of the air space inside, and so on. We all know what happens when we adjust the settings on a ten-band EQ, right? Well, installing a resonator is like doing a major alteration of all those little potentiometers on the "sound board" of a guitar. Noting that the resonator is a good deal smaller than the original sound box of the guitar, someone asked "If the resonator doesn't increase the volume, does it decrease it?" Intuitively, it would seem so, but I have heard too many brilliant and loud resonator models that I wouldn't dare make that claim. Whatever else it does, it at least compensates for the reduction of airspace inside and so forth. The back of the resonator does indeed vibrate more or less unimpeded, so the real back is a sort of second back, a sacrificial protective plate. It has some vibration and effect on the overall tone of the guitar, of course, but it's less important (at least theoretically - most players, unless they're standing up or have a big fat tummy, don't touch that much of the back of a guitar anyway). So that aspect, in my opinion anyway, is not particularly important. It's all Mario ever said was behind the resonator. It turns out to do something else he never suspected, or at least could not articulate. And a good thing it is. We are not complaining! Perhaps we can, as one nice fellow suggested, simply call it a "character-enhancing" device.